We recently bumped into the brilliant and utterly fabulous luxury Invitation Designer, Ceci Johnson, at the Engage!17 Luxury Wedding Business Summit in the Cayman Islands and simply had to let our adoration be known. We've dubbed her the "Invite Extroardinaire", but don't just take it from us, the Founder of Ceci New York has been named “Expert Stationer” by New York Magazine, Tory Burch’s “Woman to Watch” and “Invitation Innovator” by WeTV. Ceci and her team of artists have been leaving us in wonder and awe with every social media post - unfolding, unwrapping or unwinding their extravagent wedding and event invitations - whether it be emerging 3D crafts from envelopes or boxes, the stunning invites are nothing short of works of art, often mixing materials to bring to life the essence of the event in an invitation, ensuring every invite received is a thrilling experience. While Weddings are certainly Ceci's specialty, they have expanded their offerings to include stationery for social & parties, corporate, baby & kids, as well as home & gifts. We visited Ceci's New York office for a behind-the-scenes look and to learn a little bit more about her passions and inspirations. JoAnne V. Brown: Take us on a brief “day in the life of” New York’s most acclaimed invitation designer – What is a typical day with Ceci like? Ceci Johnson: I wish I could say I had typical days, but quite honestly, no two days are ever alike. And that is one aspect that I really love about my job. Not only do I get to design for the world’s most wonderful people, but my days are constantly action packed. I prefer to be busy and productive and often find myself wearing many hats throughout my day. From taking care of my children in the morning and evenings (Mommy hat), to running between design appointments (Designer hat), client presentations and new business meetings (Business Woman hat), critiques with my Team Ceci (CEO hat), to press checks to ensure the quality of our work is just the way I envisioned it (Creative Director hat), painting or drawing a commissioned Ceci Couture artwork (artist hat), to dreaming about the future of my brand (Entrepreneur hat). There are so many facets of me which in turn reflects in all I juggle in a given day. JVB: You don’t just create stunning wedding invitations and stationery. Tell us a little bit about the additional services you provide. 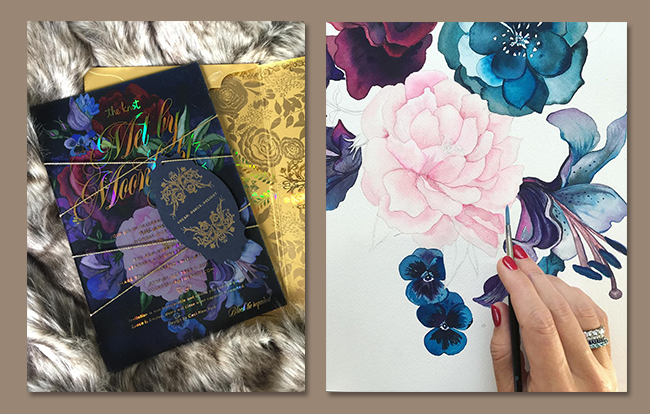 Ceci Johnson: We love to go beyond the wedding invitations and brand your event, carrying our custom artwork into your day or weekend. There are so many opportunities to create memorable moments throughout - from the welcome bags, to the decor at the party to the thank you notes - tying it all together makes for an unforgettable event. We also love to carry that personalized logo we designed for you into your new life together. We now sell many lifestyle products that enhance your everyday entertaining, like custom engraved wine glasses, dishes, and placemats, and many more products, such as hand painted journals and personal stationery, that aim to beautify your world. JVB: What is the most rewarding aspect of your career? Ceci Johnson: It’s actually really quite simple - but I find such reward in making our clients so happy. In turn, that makes me and my Team Ceci very happy. We joke, even though we are designers, we are in the business of making people happy. There is nothing more rewarding than to hear that our clients received so many compliments on our work and how working with Ceci New York was one of the best parts of planning their event! That says something to me. We live for that! JVB: Tell us one of your favorite or most challenging projects ever worked? Ceci Johnson: Honestly, it’s really difficult for me to pick just one favorite. To me, it’s like asking a mother to pick their favorite child. 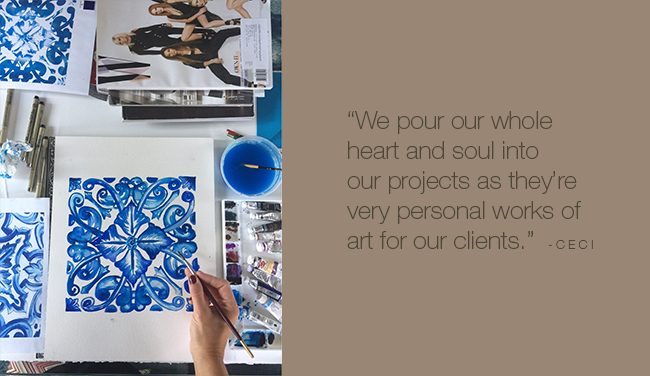 We pour our whole heart and soul into our projects as they’re very personal works of art for our clients. Plus, we always strive to challenge ourselves every day on each new creative project as we’re constantly pushing to innovate and create what’s never been done before. It’s boring to do the same thing over and over again. We thrive on innovation. Coming up with new ideas every day is the best challenge ever! JVB: Approximately how many destination brides do you work with per year? 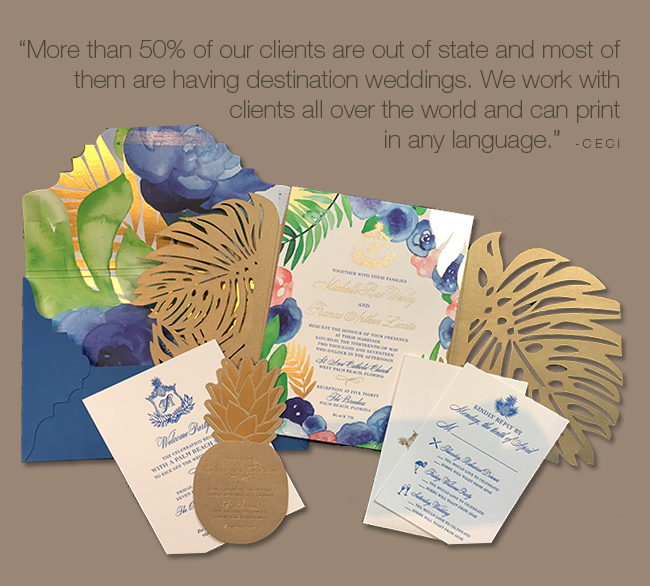 Ceci Johnson: More than 50% of our clients are out of state and most of them are having destination weddings. We work with clients all over the world and can print in any language. With design, there are no limits to what we can create. We have a very buttoned up creative process that makes it super easy to work with us no matter where you are in the world! JVB: How would you describe your “signature style” when it comes to your designs? 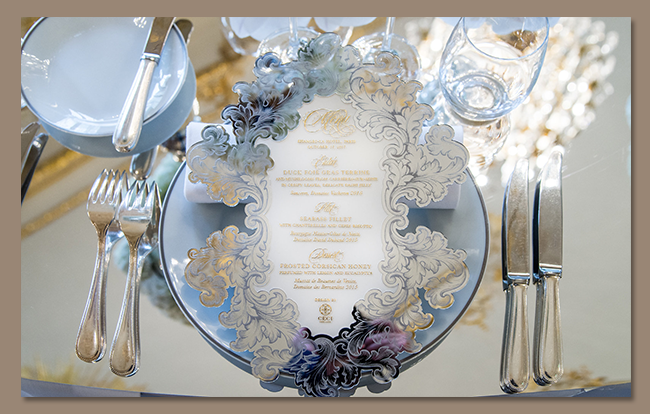 Ceci Johnson: I would say my work embodies “downtown style meets classic elegance.” We are well known for our jaw dropping innovative invitations that are as awe-inspiring as they are beautiful. We love to push the limits of creativity in all we do, but when it comes to our signature, it always comes back to designs that exude glamour and opulence. Luxury down to the tiniest detail. JVB: Walk our brides through the Ceci New York process, from the first point of contact with the client to receiving the final product. Ceci Johnson: I love to figure out my client’s style. For me, it’s easy and fun. I try to eliminate the stress of having to know an exact invitation design before starting the process. That’s our job! 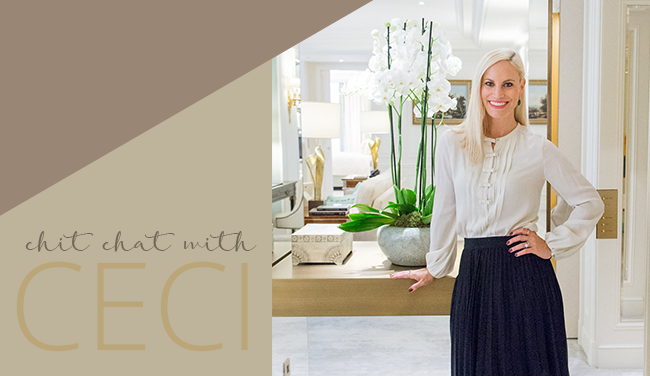 Our Ceci Design Experience begins with our consultation where it’s all about asking a lot of questions, and doing a deep dive into who you are and what makes you tick. Since this is such a personalized experience, we consider what kind of person you are, what your home looks like, what your style is, what you love individually and together as a couple. 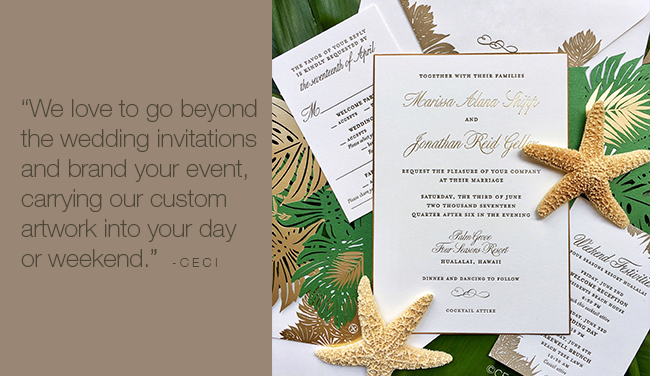 Once we define your style, we start brainstorming ideas for your unique invitations. I think it’s the ultimate luxury to turn yourself over to a talented designer’s hands and let them do what they do best. The results are always something you could have never dreamed of yourself! From there we present our design ideas, sketches, mood boards, color palettes and font studies and then you get to select your favorite concepts for us to start refining. This is where it comes to life before your eyes! The chosen direction goes through many rounds of refinement until it’s just the way you want it. 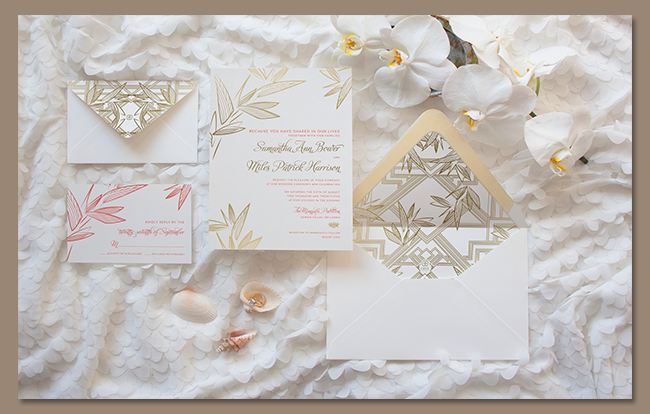 Once ready, your invitation design goes into production and is handmade by our printers. Each invitation is meticulously created and overseen by my team to ensure it’s up to our quality standards and just the way we envisioned. This process involves many artisans on our team and takes about 2-3 months, so best to book in advance so you can enjoy the process without being rushed. Once it’s finished, we can be as full service as you wish and even stuff, seal and mail your invitations for you. The best part is when all your guests start receiving your invitations in the mail and the compliments flow in of how amazing they are and how they cannot wait to celebrate your special day with you! That’s the best! JVB: Did you always know you wanted to be a stationery designer? If not, how did you find your way there. Ceci Johnson: I never set out to be an invitation designer it all just kind of happened on the side and suddenly I realized I had something special to offer. I started my business out of my apartment in NYC all by myself with nothing but passion and a dream over 14 years ago. I had studied graphic design and art in college and knew I loved designing and creating for others. I also am one of those crazy people who have that entrepreneurial fire in my belly and have always been busy doing projects on the side all my life in my free time. Which is honestly how #CeciNewYork started. I was designing invitations during my off hours for coworkers and friends when, before I knew it, my name was being passed around and people were suddenly reaching out to me to design for them! It was a reassuring feeling to know that people loved my work enough that they wanted me to design for their life's biggest occasions. I knew it was what I was meant to be doing because the passion was there for me from the very beginning and still is to this day. So that must mean something! Soon after I launched, editors started calling. I was featured in all the big magazines and won the “Trendsetter Award” and the prestigious “Expert Designer” recognition by New York Magazine, which put me on the map. It’s all been an amazing entrepreneurial roller coaster ride! JVB: You work with destination brides from around the world. What do you find is the biggest challenge in doing this and how do you overcome it? Ceci Johnson: Thankfully, it’s very fun and enjoyable to work with our clients no matter where they are located in the world. With technology today, we can facetime or skype to go over designs just like we’re sitting in the same room! Each bride gets a dedicated expert Account Manager who, we joke, becomes your new BFF, because we work so closely every step of the way on all the details together. So honestly, we do not really have any challenges working with clients who are not local. As long as you have a computer and are able to receive packages and email, we can work with you. We send you proofs via email and printed samples of ink colors and paper swatches so there is no detail left unturned. We make sure you understand exactly what it’s going to look like so there is no worry. We stand behind all our work and all our clients trust me to ensure it’s just perfect. I always make sure each piece we create is something we are extremely proud of as well. I wouldn’t have it any other way. 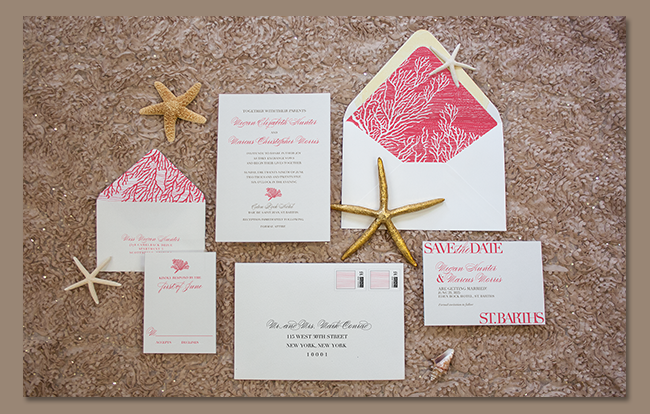 JVB: When it comes to invitations, what have you found is the most important detail to a destination bride or any bride? Ceci Johnson: I always recommend to start early. Do not wait to hire your invitation designer. Once you book your venue, book your invitation designer immediately. Everyone always underestimates how long this process takes. You have so many details to communicate to your guests so it’s best to not delay. You must account for longer lead times to design and create your save the dates and print the invitations, so plan accordingly. Our recommendation is to order save the dates once you book your venue and reserve your wedding date. Invitations should be mailed out 2 months before the wedding date. So plan to order your custom invitations about 5-8 months before your wedding. The earlier the better, I always say! JVB: Any words of advice for a nervous destination wedding bride? Ceci Johnson: Just trust. Relax and try to enjoy the process - you’ll have way more fun that way. Always go with your gut and follow your heart when making decisions on who to work with for your creative team. Once you hire them, turn yourself over completely and let them do what they do best. That’s when the innovation happens. To me, it’s the ultimate luxury to have a designer design and create exclusively for you! Do not drive yourself crazy looking online at thousands of images of what has already been done before. Trust your creative professionals to take you to special places no one has ever gone before. How cool to be a trendsetter! Visit the website www.cecinewyork.com to see more of the beautiful designs + shop the collections.